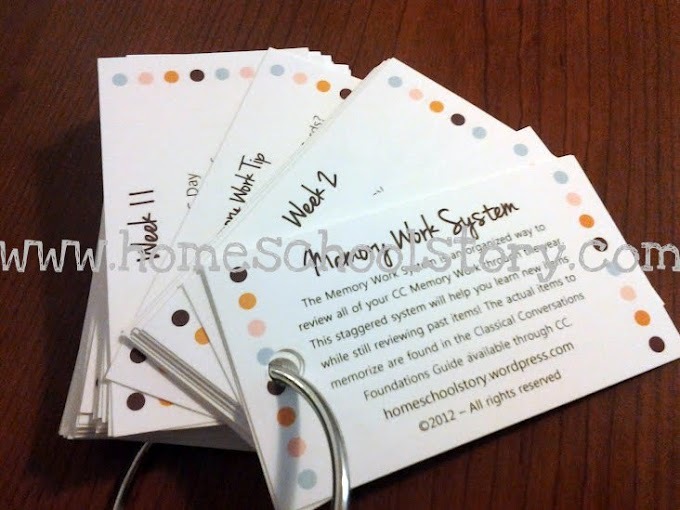 The Memory Work System is a set of cards that can be used with the Classical Conversations Foundations program. 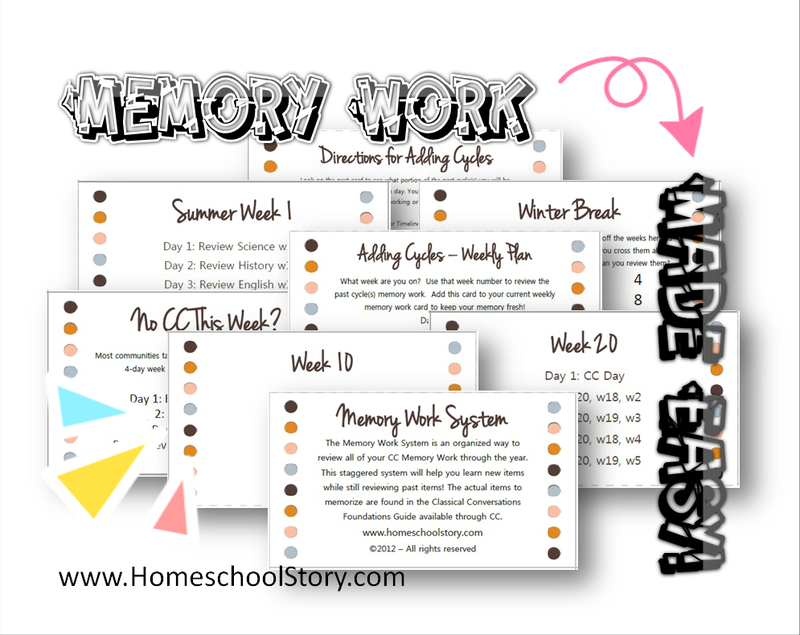 These cards will help you review current and past memory work each day in a systematic way. They are easy to use and easy to follow! Even your youngest Foundations aged children can follow these simple cards. Now you don’t have to worry about your memory work! Just pick up the week’s card and follow! I have thought about making a box system, but that’s as far as I’ve gotten. Plus, I have a tendency to spend lots of time making something, only to put it on a shelf to collect dust. Let’s just say that it was impeccable timing when CC Smart Mama Jaime Gravitt, (Support Manager for Georgia) over at Homeschool Story informed me of a similar system that did not require me to make something. One of my personal favorite things about this system: The suggestions for adding extra cycles. I have wanted to review past cycles but just never felt motivated on how to do it well. Jaime’s ideas are so manageable. question… could I just buy these flashcards and skip the full foundations book? My kids are 4 and 6 just starting CC. Im having a hard time buying the full book since its changing after this year, thanks! Hi Kayla, sorry for the late reply…and you probably already figured things out by now, but I want to answer because others might have the same question. So the answer is no… these cards will not replace the guide because they do NOT contain the actual memory work that you memorize. They only contain the systematic system to review each week’s work throughout the year! You can, however, buy the Classical Conversations Memory Flash Cards from CC. They contain the actual memory work that you’ll need. hope that helps!